A new study published by researchers at the University of Hawaii at Manoa claims that climate change could make it so that snow in the Aloha State could be eliminated by the end of the century. The.. Snow Ruins Holiday Fun in Hawaii Areas of the usually sun-drenched state of Hawaii have been covered by a thick blanket of snow. The weather experts have said it is not unusual for some snow to fall.. Heavy snowfall is forecast for the summits of Hawaii's biggest mountains, Mauna Loa and Mauna Kea, as wind and snow engulf the high peaks. There could be snow in Hawaii through Saturday on the summits of Mauna Kea and Mauna Loa, according to National Weather Service winter storm warnings, wrote Hawaii News Now on Friday. Wait, what? June snow in Hawaii?! 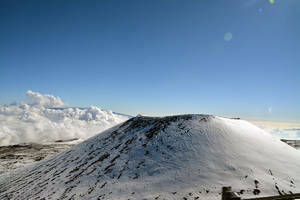 A dusting of snow was reported early Tuesday morning at Mauna Kea in Hawaii, the National Weather Service said.